Amazing as it may seem, little has been written about one of the most important developments in modern U.S. history: The campaign to polarize America into viewing itself as a nation of conservatives, with liberals and dissenters branded as unpatriotic outcasts. 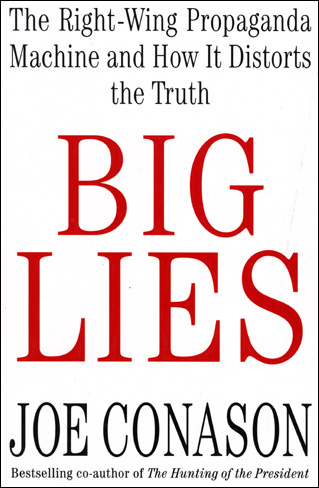 BIG LIES provides a unique overview of the 20-year effort to recast the intolerant, elitist Republican Party as a pseudo-populist, grassroots movement, with George W. Bush as a likeable, jest-folks figurehead. Monitor columnist Joe Conason also debunks the myth that the supposedly liberal media tries to suppress conservatives, showing instead an eagerness to promote right-wing viewpoints. Ann Coulter launched the book tour of "Slander" with an appearance on the Today show, even though the book compared host Katie Couric to Hitler's mistress, Eva Braun. The new conservative movement is also a story of big hypocrisy, with Republican leaders like Newt Gingrich embracing "family values" while cheating on his second wife, and talk radio superstar Rush Limbaugh claiming to be a "regular guy" while favoring $2,000 bottles of wine. BIG LIES is a antidote to a heavy diet of right-wing bull. .